I have a thing about safety. I made my kids wear bike helmets. I never start the car without making sure everyone is belted. I check the smoke detectors twice a year. I even lightly run my hand along the banister when I descend the stairs. But I was not always this way. When I was sixteen, I got my driver’s license. This is a rite of passage that most of us make, and I anticipated it with great excitement. Most teenagers learn to drive on the family car, and my mother’s car was a Saab with five speeds on the steering column. My dad, a traveling salesman, had driven it for thousands of miles. When he replaced the motor, he gave it to my mother. The little red Saab was old and creaky, but ran well enough to transport her to nearby Palmer, where she taught school. As soon as I earned my learner’s permit, my mother gave me permission to practice pulling the car forward and back in the drive way. She showed me how to put the car in gear, ease off the clutch and ease on the gas until the car inched forward, braking when I got to the end of the drive. She showed me how to find reverse and do the same thing until I reached the intersection of the drive way and Green Street. After watching me a few times, she assumed I had mastered the process, and went to her room to take a nap. I drove back and forth several times, feeling cockier with every pass. I turned on the radio, so I could drive to music. I rolled down the windows so the neighbors would be sure to see that I was driving. I pulled up and backed out several times, not realizing that with each pass, I inched closer to the stockade fence that separated our driveway from our next-door neighbor’s. Sure enough, on a backward run, I heard a loud splintering crunch. I slammed on the brake and got out to survey the damage, where I found the front bumper to be firmly snarled around the fence. I ran to my mother’s room, waking her with my sobs, and explained what I had done. She, relieved that I had not run over one of my younger siblings, laughed and after a few attempts, disengaged the car from the fence. Despite my encounter with the fence, I was undeterred, and a few days later, I suggested to my mother that we try driving through the neighborhood. I was ecstatic, but quickly found that driving a stick while navigating the hilly roads of Monson was much more difficult. I stalled and stuttered around the corner from Green Street to Bridge Street. Mom made it a short trip and soon after, enrolled me in Belmont Driving School where I learned to drive on the flat, quiet side streets of Palmer, in a car with an automatic transmission. I passed my driver’s test on the first attempt and joyfully returned home to announce my victory. My parents, who surely graduated from the “Figure-it-Out-For-Yourself Academy of Parenting,” handed me the keys to the Saab and told me to teach myself how to drive it. To understand exactly what this learning curve was like, you must first realize that in a family of eight children, very little was done alone. All six of my younger siblings piled into the car and together we set off to master the belching red beast. The beginning of the trip was fairly easy. After the first few shudder and stalls, I figured out that revving the engine to the auricular equivalent of a jet engine allowed me to get the car in gear and begin moving without stalling. The peanut gallery of the back seat jeered when I stalled and cheered when we moved, finally settling in for a ride about town by the time I hit third gear. Together we sailed over the country roads of Monson- over Bridge Street, past the funeral home to Lower Hampden Road, past Highland Ave, and over the “thank-you-ma’ams.” Finally, I decided we should return home. Ricky was hungry. Missy had to go to the bathroom. I turned into Ely Road to turn around, which at the time, seemed like a good idea. However, once I turned the car around, I realized that I needed to stop at the end of a rise to turn back onto Lower Hampden Road. This meant I had to stop on a hill- a skill I had not yet mastered. I climbed the hill, stopped the car and looked for oncoming traffic. Seeing that it was safe, I slipped my foot from the brake to the gas, and at the same time let out the clutch. The car stalled. The peanut gallery jeered. I let the car roll back to the bottom of the hill so I could restart and cautiously crept to the crest of the rise. Again when I reached the intersection I stalled the car. I rolled back to the base of the hill and tried again, with the same result. “I have to pee!” Missy whined. I could feel a trickle of sweat running down my back. I wished I could leave the car and walk home. I wish I had never gone for this stupid drive. I wished I were an only child. I wanted to cry, but a long time ago I had learned that one has to take destiny into one’s own hands. Ordering the peanut gallery to watch from each window for oncoming traffic, I revved the engine once more. “Yell if you see a car coming!” I warned, and gunned the engine. I popped the clutch and roared to the top of the hill, where I made a right hand turn onto Lower Hampden Road without even slowing down. The kids cheered and clapped. I breathed a sigh of relief and slowed to a more cautious pace. They didn’t tell, and I spent the next several years playing indebted chauffeur. It was, to be sure, a dangerous move. My license should have been taken away. But it was a time when cars didn’t have seatbelts, cyclists didn’t wear helmets, and parents didn’t ask where we were going. They just told us to be back by supper. Besides, I came from the school of “Figure-It-Out-For-Yourself” and I did. From there, my driving did nothing but improve, and with the exception of small incident involving a State owned care while working as a VISTA in Idaho, I have a totally uneventful driving record. But that’s another story for another post. 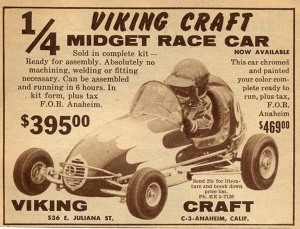 When I was a little girl I raced quarter midgets. These little cars were scaled down versions of midget race cars and were raced by children on a makeshift race track surrounded by hay bales. 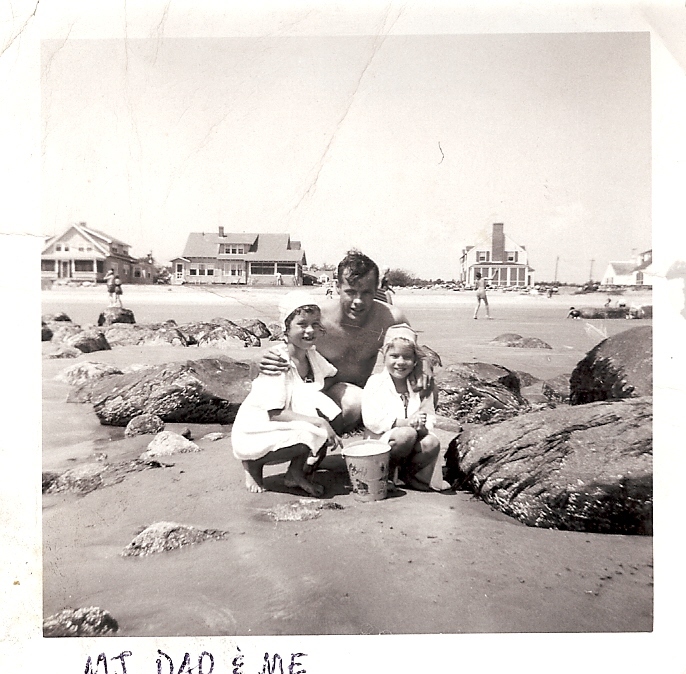 My father, a race car enthusiast, thought that it would be a fun family activity for his children to compete, so my older sister Martha-Jean was given a helmet and a car, and taught to drive. Martha-Jean was a natural, and soon was known as “Lead Foot” around the circuit. I tried to imagine why my sister would want a foot made of lead, but I idolized Martha-Jean and wanted to be just like her, so at the age of four, I made my debut as a race car driver. I was to be a Pee Wee. I hated the term Pee Wee. To me it was an insult. 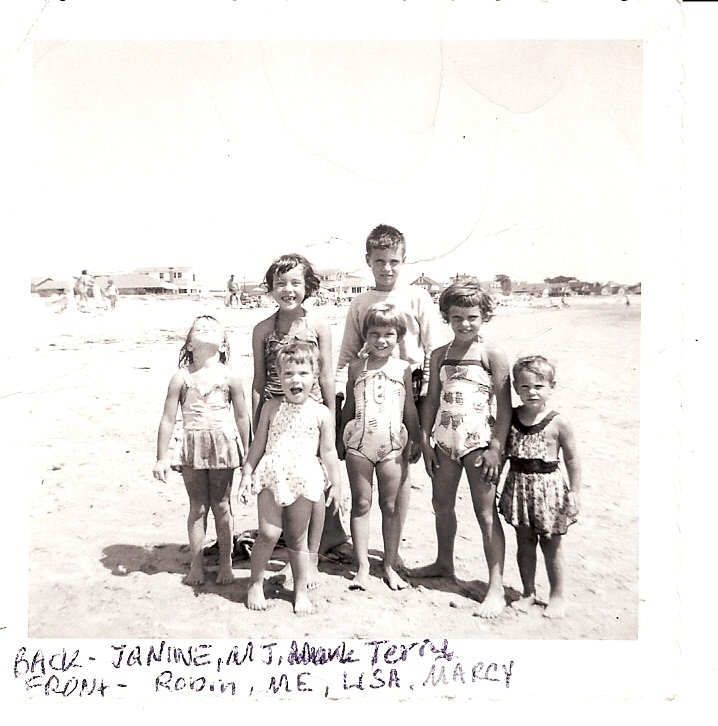 I wanted to be one of the big kids- the seven- year olds, like Martha- Jean. I wanted to be called Lead Foot. I wanted to fill my dresser with trophies and hang ribbons on my wall. But four-year olds were Pee Wees, and I had the choice of being a Pee Wee, or nothing at all. I chose Pee Wee. There were preparations to make. On Sunday mornings, my father quizzed me on the meanings of the colored flags. Green meant go. Yellow meant caution. I didn’t really know what caution meant, but I knew when you saw yellow, you slowed down. And the checkered flag meant the race was over. Being first to cross the finish line meant you could circle the track in a victory lap while holding the checkered flag. I had watched my sister do this many times and dreamed that someday I might hold the fluttering checkered flag in a victory lap. In practice runs, we discovered that I was too small to see over the steering wheel. My parents stuffed pillows behind me and a folded blanket under my bottom so I could reach the gas pedal. Once I was on the track, my father quickly learned that I could navigate the path but I could not steer and take my hand off the wheel long enough to hit the kill switch. He had to run after me, make a grab for the toggle switch and turn off the engine. After many weeks of preparation, the day of my first race finally arrived. My stomach did flip-flops as my father buckled the chin strap to Martha-Jean’s helmet under my chin, and started the ignition. The helmet was too big and slid down to my nose, but a pair of goggles lifted it back far enough so I could see. I sat nervously until the green flag was waved, and then I began circling the track along with the other Pee Wees. In the practice laps, rounding the track was easy, but now, with several other cars around me and people watching from behind the hay bales, it was far more difficult. I wondered where my mother was, and if Martha-Jean was watching, and if my father would be able to catch me in time to hit the kill switch. In a moment of lost concentration, I veered too far to the side of the track and struck a hay bale, causing my car to spin out. Faces, hay and colored flags spun like a kaleidoscope, until I recognized the sound of my father’s chuckle as he switched the car off. “Hey, Boo, what happened? You spun out!” he laughed. “Did I win?” I so much wanted him to smile with pride like he did when Martha-Jean won. I competed in several races after that, and spun out more times than I finished. I didn’t really enjoy racing- it made my stomach ache, and I couldn’t figure out what I needed to do to win. But finally, perhaps by default, my day came. I was the first to cross the finish line. The flag man gave me the checkered flag for my victory lap. I proudly held it up so it would flutter in the breeze, but it was heavy and the wind resistance pulled it from my grasp. I traveled only a few feet before I dropped it. The flag man picked it up and handed it to me, and I dropped it again. And again. It was more a humiliation lap than a victory lap. “No matter. Soon I’ll get my trophy,” I told myself. Martha-Jean had lots of trophies- tall ones in electric red and blue topped with gold cars and molded drivers. You could see the facial features on the drivers- I always thought they looked like my sister. Standing with the other racers, I wiggled with anticipation, imagining my trophy in blue, with a shiny car whose driver looked like me. Finally, my name was called and I ostentatiously strutted forward to collect my trophy. “Perhaps now, they will call me Lead Foot,” I thought. I scanned the table for something tall and elegant, but instead I was handed a short white plastic base with a tiny golden car and driver screwed to the top. The driver was too small to have a face. It was just a lump of metal dipped in gold paint. I smiled on the outside, but inside I cringed. It was a trophy fit for a Pee Wee. I never became the accomplished racer that my sister was. In fact, I never won another trophy for anything. But I learned the first of many lessons about trying to be someone I wasn’t, and accepting who I was. 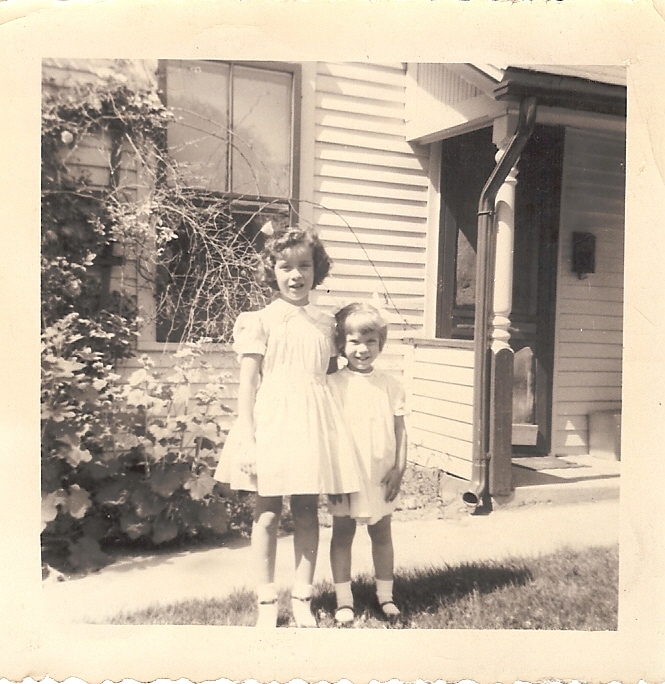 In the years to follow, I would find that I was very different from my older sister. I am not fearless, or athletic or tall and willowy as she is. Competition- even a relay race- makes my stomach queasy. She played varsity basketball. I never learned to do a lay-up. She moves to music in graceful steps that sway and dip. I dance like a monkey. 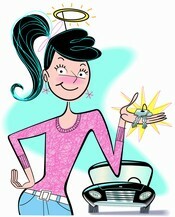 As we age, she grows skinnier, and I… well, I do not. But here’s the thing- we are not supposed to be alike. We never were meant to compete. We were meant to compliment. She is a willow, I am an oak. She is an apple. I am an orange. She is sunrise. I am sunset. And I’m okay with that. But every once in a while, when it’s late at night and nobody else is on the highway, just for a few moments, I am in my quarter midget, and I am Lead Foot. Shh…don’t tell Martha-Jean.